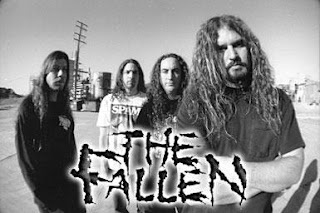 The Fallen was a four piece death metal band out of Southern California and this is their first (and only) major label release. These fine fellas go back to my Berklee days (sans bassist). I think they were called Crestfallen at the time. When I started this station (Odd Time Obsessed) I was in need of material and I happened to find them on MySpace. Mark Venir (guit) kindly to sent me this and their second self released CD "Tones in Which We Speak". Glad he did, they are excellent musicians using multi-meters quite naturally. They give death metal a good name. I dig their meter use that is oh so smooth and the acoustic guitar has a nice place too. They keep within the confines of the genre but also add a new dimension to it. It would have been nice to hear them expand out of the parameters and maybe use some of the jazz/classical/bossa nova skills that I know they have. But none the less this is a great metal album.